Is this liquid or gel please? This is a gel based sanitiser. 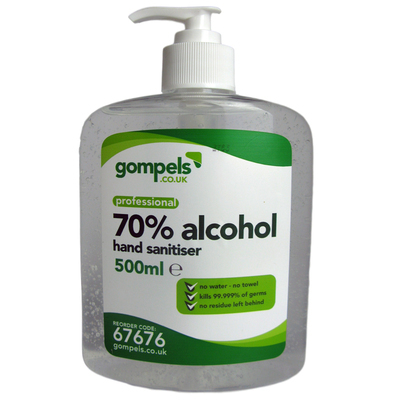 Improve the quality and performance of your current hand hygiene techniques with our Gompels Alcohol Hand Sanitiser. With it's water less formulation which reduces the risk of skin irritation, this easily applied gel kills up to 99.999% of bacteria. A single pump will release the recommended 3ml of alcohol hand sanitiser which can be then be massage into the hands until dry for the most effective performance. Suitable for any work environment from the front desk of an office through to hospital wards and places of food preparation, this alcohol hand sanitiser gel reduces the risk of cross contamination while leaving behind no residue or odour.